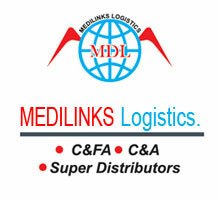 Medilinks Logistics is a part of group Dvijay that specializes in Pharma distribution and Supply chain management, having presence in all formats from “C&FA and C&A or Super Distributors ” to stockist (Dvijay) & organized retailing (Pink Pharmacy). Going by the Pharma industry needs Medilinks offersefficient logistics and a supply chain management solutionfor distribution of medicines right up to the consumers. Emcure Pharmaceuticals Ltd. (Since 2006)Area- Northern Maharashtra region. Genova Biopharmaceutical Ltd. (Since 2006)Area- Northern Maharashtra region. I-Med Healthcare (Since 2012)Area- Northern Maharashtra region. Supply chain management is a modern day derivative Science in its kind, and Medilinks Logistics does justice to it in ways more than one. For C&FA and C&A operations there are 15 fully dedicated staff members, a Warehouse Manager and a Sales Supervisor. Nashik being a major industrial town & well connected with rest of Maharashtra all the major transport agencies have their offices in Nashik. A consignment from Nashik takes maximum 48 hours to reach any said destination across Maharashtra & India. One of the best I.T. setup across industry lines. Thein house team of expertscan work in any software environment like SAP, ERP or any other company provided software. Company staff is well acquainted with the use of modern day communication techniques like emails, audio - video conferencing etc. The proficiency to combine above skills has increased the efficiency and accuracy of supply chain management. Medilinks is a forerunner in adapting any newer technological skills& supply chain concepts. An ultra-modern 6000 Sq. Ft. warehouse premise for C&FA and C&A operations. The premise is provided with 5 cubical cabins for Managers, an air-conditioned conference room for 21 people, a billing section & administrative office for company officials.A walk in cold room for storage between 2deg to 8deg Celsius, Separate storage for drugs requiring temp below 25deg Celsius. Pallets and Racks amongst other utilities. Medilinks Logistics runs on ZERO down time in every area of supply chain. May it be I.T., power, staff, logistics or any other area. The well designed backup support ensuresuninterrupted supply chain 365days. This core competency gives competitive advantage to our business associates. This is a part of adopting GDP (Good Distribution Practice).